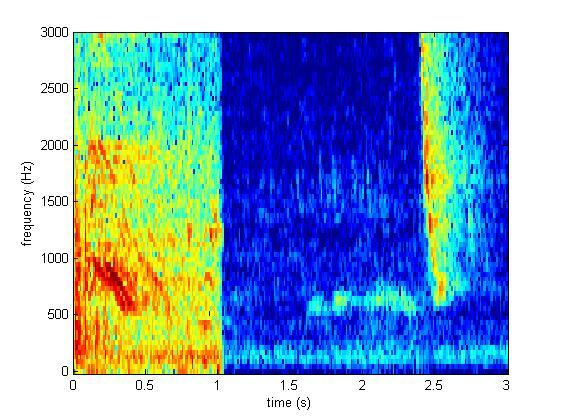 The spectrogram below shows 4 grunts, 2 from each player. The first is from Sharapova and happens at the left side of the graph. A spectrogram shows how the frequency of sound varies over time, in this case bright red indicates strong parts of the sound and blue weak bits. The bright red line drooping down from left to right shows how the frequency of the Sharapova’s cry starts at about 900 Hz and drops to about 600 Hz in about a third of a second. 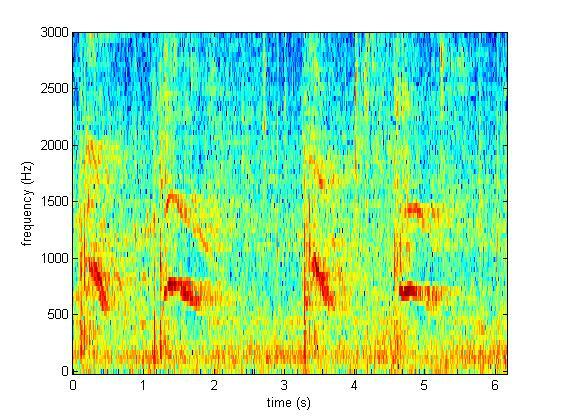 Comparing the spectrograms, the whip-bird’s downward chirp (right side of the above plot) is over a larger frequency range going from 3000 to 500 Hz and happens much faster than Sharapova’s grunt. The vocal athleticism of the whip-bird is remarkable, honed to perfection as females probably listen to the quality of the chirp when selecting a mate. Sharapova’s grunt is also amplified and elongated by the Wimbledon roof when it is closed, see How the Centre Court roof changes the sound at Wimbledon. Which other players have annoying grunts I could analyse? This entry was posted in sport, vocalisation and tagged acoustic features, chirp, Sharapova, sound, tennis, vocalisation, voice, whip bird, wimbledon. Bookmark the permalink. So, when will the tennis authorities act against Sharapova? Her shrieking (take note: shrieking, not grunting) is WAY out of bounds. It is totally totally unacceptable, it is a form of tennis terrorism – and not only committed against opponents, but against spectators and TV audiences as well. Set a limit in terms of decibels, and if the sound gun says she’s beyond the limit on any given shriek, she loses the point. Quite simple. Watch how quickly she’ll adapt to a civil, decent, acceptable, respectable way of expressing her enthusiasm. Her time-wasting antics is also beyond the scope, turning her back on opponents and waiting FOR EVER between first and second serves. Tennis is doing itself a huge disservice by not getting Sharapova under control.